One of the most imaginative and original pieces of research in management… An understanding of the importance of team-building will continue to be a major factor in the successful growth and development of enterprises. Meredith Belbin’s work on teams has become part of everyday language in organisations all over the world. Management Teams is required reading for managers concerned with achieving the best results from those who report to them. Management Teams is one of the most widely-read, imaginative and influential books on this vital area of management research and was cited by the Financial Times as one of the top 50 business books of all time. Now in its third edition it has been completely rewritten and fully updated for managers and trainers, with succinct, practical information which demonstrates how to apply management theory learned into practical action to make a real difference in the workplace. Meredith Belbin’s own explanation of his Team Roles method allows readers to benefit from his extensive experience of its use in practice. Numerous real world case studies show how to apply the theory to real situations. Simply putting a number of people together and expecting them to work as a team is not enough. 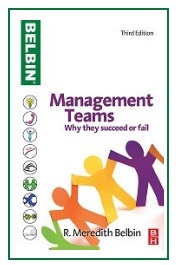 10 Case studies using Belbin Team Roles. N.B. Any reproduction of the 8-Team Role Self-Perception Inventory found in previous editions of this book is a breach of intellectual copyright.